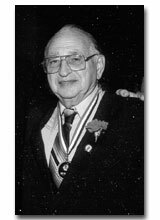 One of the United States' most prominent track and field officials, Murray Rosenstein was America's premiere judge in the Walk event. Following a long career in which he officiated track & field events throughout the world, Rosenstein was named Walk judge for the 1984 Olympic Games--one of only two American judges selected for the event. He has been a member of the International Panel of Race Walk Judges since 1969. As a young man, Murray was, himself, an outstanding runner, winning New York's James E. Sullivan Award far long distance running. He is the founder of the nationally recognized “Run For Your Life Club”. In 1969, Murray was manager of the U.S. Track Team at the World Maccabiah Games in Israel.